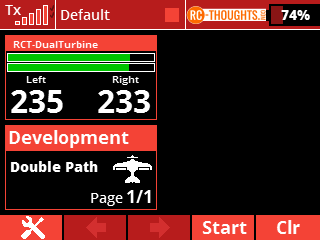 After a request from France there’s a new Lua-app out for the big boys with two turbines in same plane. 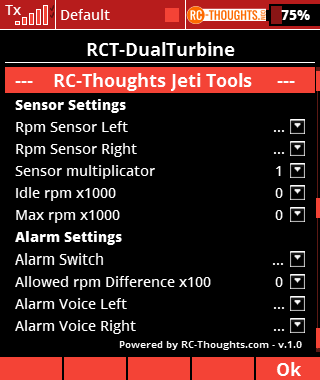 Reader who contacted wanted an easy way to monitor the two turbines rpm’s and to get an alarm when there is a difference. The conventional way of telemetry-alarms have difficulties in making the alarm when it should compare some other, always also changing, telemetry-value. But we have Lua, so let’s make it! Quite little settings, one informative telemetry-screen, that’s all that is needed! And features are not too shabby either! Available for DC/DS-24, requires firmware 4.22 or higher. App does not run with older firmware. To read the setup-process and usage and to get it go to DualTurbine page here! Little big Lua-app release – TimeSpeaker is out! Great stuff, will give a try this week-end to my Mako A10 using 2 Kingtech 45 turbines with Xicoy sensors and let you know results.